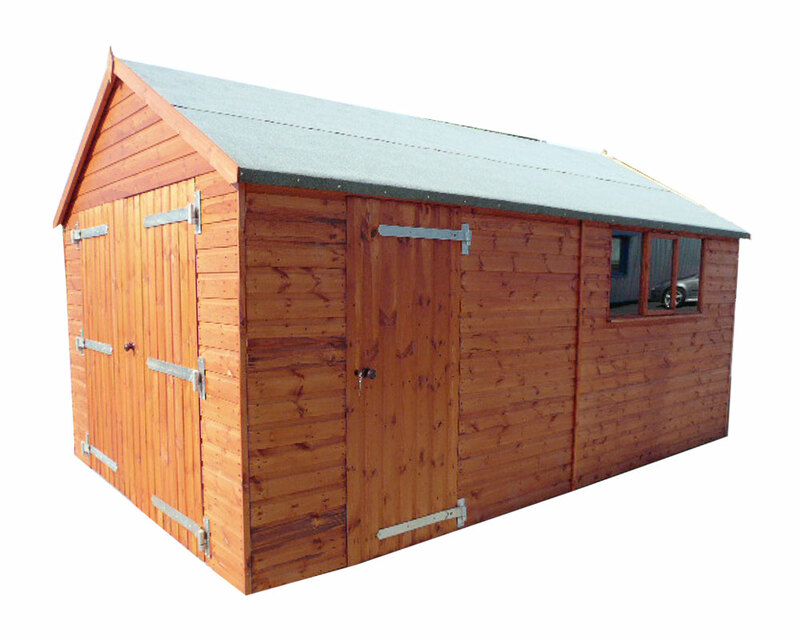 Model shown: Apex Garage 18' x 12' showing 3 pane opening window, Side Door and Double Doors. • 50mm x 50mm Framing throughout with diagonal side bracing • Substantial 75 x 50mm roof truss 1 up to 15ft, 3 up to 20ft, 5 up to 30ft • Heavy duty roofing felt • Joinery windows • No floor. • Eaves height. 1895mm • Ridge height. 8′ 2490mm, 10′ 2595mm, 12′ 2690mm • Double doors 1880 x 2135mm • Side door 1775mm x 762mm • All doors are in 75mm x 50mm framing and braced • Windows 610 x 457mm • Opening window 552 x 400mm • Framing 50 x 50mm • Cladding 16 x 125mm. The Garage is a great timber alternative for those not looking to build a concrete garage, it’s sectional and comes complete with double doors and a side door. Due to the size of this product, it is not available to order online – please contact us on 020 8640 3339 to discuss installation.